There’s a lot you can learn from your car via in-dash dongles like Automatic, but if you’re more interested in interacting with your car, AwareCar may be for you. With an app and a Bluetooth beacon, you’ll get relevant, location-based info — all for $9. The actual hardware is nothing more than a small Bluetooth beacon you slip in your car. 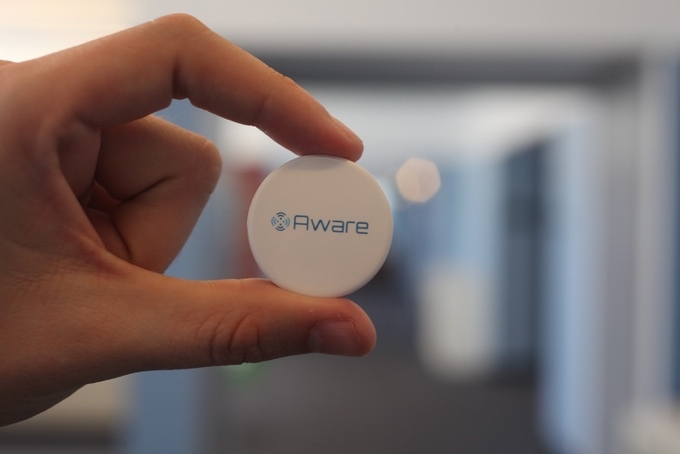 The AwareCar team tells us those beacons will normally transmit at 20 meters or so, but the range can drop to 5 meters depending on where you stash it in your car (they recommend the glove box). The goal is to do much of what a platform like Automatic does, except without the spendy hardware. The main attraction of AwareCar is that it tracks where you’ve parked, and can tell you how close you are to your car — even if you’re on a different level in a parking garage. AwareCar also reminds you to pay for parking if you’re in a metered spot. Using data provided by cities (and GPS), AwareCar may know you’ve parked in a metered spot, and asks you to tell it how much time you’ve paid for. When your time is almost up, AwareCar reminds you so you can either leave or pay for additional parking. In locations where metered parking spot data isn’t known, AwareCar tells me it plans to roll out a crowd-sourcing angle to get users reporting on metered spots. Later on, they’d like to make the info available via an API. The beacon also knows you’re approaching, and the app can be set to queue other apps using iOS’ Continuity feature. For instance, if you are a heavy Google Maps user, you’d find it as an icon on the bottom of your lock screen. The Kickstarter campaign is asking for $15,000, and that’s just so the team can focus on building its software. Co-founders Dani and Drew say the hardware is ready to go.